First Line: "Death by chocolate. That's what the coroner's report will read," Olivia Limoges said to the woman sitting next to her. Decadence-- the new shop in Oyster Bay-- is definitely a hit, since it deals in all things chocolate, and when chocoholic Olivia Limoges agrees to sponsor a storyteller's retreat for the Southern Storytellers Network, she's doing it for more than one reason. All members of the Bayside Book Writers critique group have manuscripts in various stages of completion, but Olivia's novel is completely stalled. She's hoping to get some tips and inspiration from the pros attending the retreat. She falls under the spell of the best storyteller of them all, Violetta Devereaux, but when the award-winning woman's announcement that she will meet her end in Oyster Bay comes true, Olivia and the rest of the Bayside Book Writers find themselves busy sifting through dozens of stories to uncover the truth... and a killer. My favorite cozy mystery series just keeps rolling along, and I'm loving it. Ellery Adams has created a series with real depth and substance, and each book is a chapter in Olivia Limoges' life. Previous books have dealt a great deal with Olivia's past, but Poisoned Prose finds her devoting a lot of thought to her future. Having always believed that she was meant to live alone, it's a huge step to even consider entering a committed relationship with Sawyer Rawlings, but that's what Olivia is doing. Before you start to think this is a one-woman book/series, nip that thought right in the bud. Each member of the Bayside Book Writers is a strong character who has progressively evolved through each book, and some fans may not be happy with how things turn out for two of the members here in this latest book. Following this group not only shows how they put their heads together to solve crimes, it also shows how a critique group can work to help writers produce marketable novels. The setting of Oyster Bay, North Carolina, makes me hear the waves on the shore and smell the salt in the air. I'd love to tag along with Olivia and her dog, Captain Haviland, as they use a metal detector on the beach each day to look for treasures. And while the setting and all those fully-fleshed characters work their magic, there's a genuine puzzler of a mystery to solve as well. 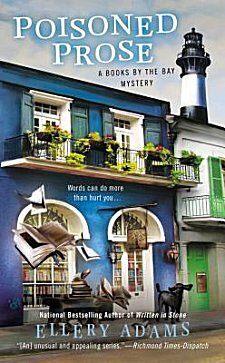 If you're the type of reader who's looking for a little less fluff in the cozy mysteries you read, I highly recommend Ellery Adams' Books by the Bay series. When I stumbled across them, it was as though I'd borrowed Olivia's metal detector and found a gold doubloon. I have this series on my wish list because of one of your previous reviews, but I just moved it up to early 2014 because of your remark about "looking for a little less fluff in the cozy mysteries". That's what I'm in the mood for. I can always rely on you, Cathy!